Tree Surgeon Paul Johnson kindly allowed me to harvest some local Western Red Cedar for making into British National Hives. I’m due to pick up the Cedar from Rowsely Sawmill tomorrow after which it’ll join the Chatsworth Cedar for seasoning. Paul’s son Perry is very keen (and very knowledgeable!) 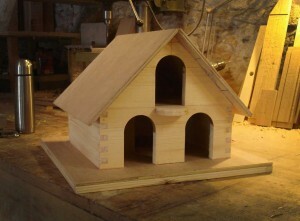 on birds and wanted a dovecote so I decided that it would be easy enough for me to return the favour. Here’s a quick photo of the result. Luckily Perry has found some doves locally and they are now in their garden shed awaiting a new home. All that’s needed now is to put some felt on the roof and paint/stain and the birds can move in. very nice! can you make a human-sized one and deliver it to Norfolk! ?